BINGHAMTON, NY - The New Jersey Devils have announced that the club has assigned forward Michael McLeod from the Mississauga Steelheads (OHL) to the Binghamton Devils. 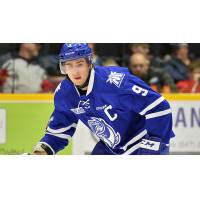 McLeod, 20, finished out his junior career as the captain of Mississauga and recorded 44 points (16 goals, 28 assists) in just 38 regular-season games. A first-round draft pick (12th overall) in 2016, McLeod had 207 points in 215 regular-season games, all with Mississauga. McLeod helped Team Canada win gold at the 2017-18 World Junior Championship in Buffalo, New York, while capturing the silver medal last year. The Binghamton Devils are back home Friday night for Autism Awareness Night against the Syracuse Crunch with only two home games remaining! Fidelis Care and the Devils have teamed up to offer Free Kids Friday. All children 12 years old or younger get a FREE ticket to the game. The tickets can only be redeemed at the Devils front office. For more information, call the Devils' front office at 607-722-7367 for more information.